UNBELIEVABLE PRICE REDUCTION! SellingRestaurants asks one simple question - are you tired of living in the city with all that traffic, noise, crime and smog? Are you looking for a safe and healthy atmosphere to raise your children or even a great place to retire and hold a part-time job running the nation's largest sub shop franchise store? Here is that rare opportunity to chase your dream and own the nation's strongest sandwich brand. 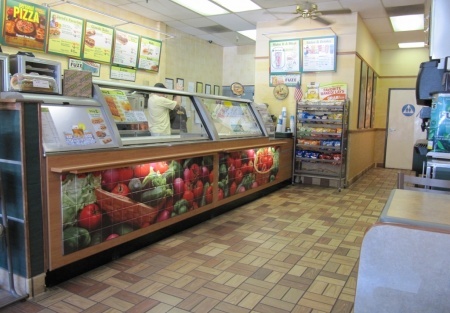 This Sub shop is located at about the 4,000 foot elevation in a great looking shopping center anchored by a large grocery store and surrounded by many types of restaurants and retail stores. This Franchise has been remodeled to the new Franchisors standards, so you won't have to spend $60,000 remodeling this unit unlike so many for sale on the market who haven't retrofitted their store. The shopping center is surrounded by large pine trees and thick green forest with plenty of local lakes and streams to fish and hunt. Being at the 4,000 foot elevation, you'll get snow but not too much. Perhaps a white Christmas would be a good change for you? But what makes this store very attractive is the low rent of only about $1,615. There are 950 Sq. Ft. in the restaurant with seating for 17 customers. This store has been in business since 1995. The owners purchased this store after retiring from Dow Chemical. After nearly four years, the sellers have determined they're just not restaurant type people. At this price and this beautiful Sierra location, this place won't last. So get up there and take a look at it. It is about 70 minute drive from Stockton. Select the orange button below to get the name and address. Store is Completely Upgraded To New Franchisor Standards - Costs $60,000! Rent is an Unbelievable $1,615 all-in a month! Steal This at this low Price Today!